It started out a beautiful summer day. Clear blue sky. Ninety-degree temps. And the wide-open waters of Lake Mead, Nevada. The perfect day to do a little boating. Early that morning, after breakfast was done, we packed up a cooler, beach towels and our 18-foot Ebbtide ski boat for a family day of play. For hours the kids tubed, the grown-ups skied, and none of us could stop smiling. It couldn’t have been better. Until the sun disappeared. Clouds blew in. And in the span of what seemed like minutes, the day went from bright and sunny to dark and foreboding. Immediately, we turned to make our way back to shore. But before we’d gone more than a hundred yards, the sky opened up. Winds howled, rain pummeled. The previously flat surface of the water became deep, white-capped swells. What followed over the next hour was terrifying, as my husband struggled to steer us to shore. I’ve been in boats most my life, and I’ve known a thunderstorm or two. But this time was different. I feared we’d capsize. Not all that different than when The Unexpected overtakes an ordinary life. Monday we launched Undone Life Together: A 5-week Conversation About the Unexpected Life. And for the past couple days we’ve been talking a lot about fear. What we’re most afraid of and how we react when fear hijacks our day. I know a thing or two about fear. For years, fear has been my biggest foe. Not the broken marriage. Not the tough seasons of parenting. Not even the cancer. Fear was the source of my sleeplessness and the root of my deepest doubts. Like a storm that sneaks up and pounds, fear packed a powerful punch. Thus, I’ve been frantically trying to find a cure. Exercise. Rest. Meditation. Truth statements. Medication. Essential oils. Counseling. All brought some benefit, as I adopted healthy practices and learned to control my thoughts and responses. But they were incomplete. None provided a cure. Fear proved inescapable. Then it occurred to me. Maybe fear isn’t the problem? You see, I don’t think fear is necessarily a bad thing. Fear is a warning signal that forces us to pay attention. Fear sharpens our senses. It keeps a toddler from approaching a stranger and a child’s hand from reaching toward a flame. In many cases, fear exists because there’s good reason to be afraid. Granted, we worry about far more than we need to. But admit it: this life gives us good cause for fear. Divorce. Disease. Suicide. Financial collapse. Unscrupulous leaders. Addicted teenagers. Unethical businesses. Death. Being human can be a scary thing, indeed. But no matter how much time and money we spend trying to fight our fear, we’ll never run out of things to be afraid of. Bad things can (and will) happen. No essential oil can cure that. So while these modern fear-fighting techniques are good, they’re incomplete. Let’s go back to the boat for a minute. That storm on Lake Mead wasn’t apocalyptic. No hurricane or tornado. It was an thunderstorm. Complete with all the theatrics, yes, but not necessarily life-threatening. The real problem wasn’t the storm. It was the size of our boat. Our boat was far too small for the size of the storm. Thus, when the waves grew, we nearly went under. As a result, we had to skill and strategize our way back to shore. A Plan B approach to a terrifying situation. I don’t think unexpected storms are our problem. Nor fear. Death, disease, addiction, loss … those struggles have been around since the beginning of time. We are not the first people to experience such. Our problem is we’ve settled for too-small boats. For too long we’ve leaned on human-constructed means of security and safety. We’ve settled for strategies, skills, temporary comforts, and modified expectations in an effort to create the happily-ever-after life. Then, when the unexpected hits, the peace dissipates and the fear swells. “We’re going to drown!” (Luke 8:24) Sounds a lot like me in a crisis. Where is my faith? For too long it’s been in itty-bitty boats. In my ability to control my circumstances and modify my emotions. And then an ocean of guilt when I learned I can’t. Develop a global awareness: All you have to do is spend a little time watching the vast sea of suffering around the world to realize you are not alone in yours. As awful as loss is, there is sweetness in the sharing of it. Search for deeper meaning: I want life to mean more than the next material comfort. I want my living to count for something more than temporal people, positions, and achievements. There is meaning beyond the immediate. I want to search ruthlessly for it. Foster an eternal perspective: If this life is all there is, than we have every reason to be terrified. If eternity is real—and it is!—then we have every reason to be overjoyed even when we cry. Believe in God’s personal love: This is the key for me. If I can develop a stronger belief in God’s true love and tenderness for me, then I can trust His presence and purposes even when I don’t understand the “why’s” of life. Experience Divine presence: Religion doesn’t cut it for me. A real God who shows up and comforts when I’m crying and whining and face-flat in fear? I’ll take me some of that. Commit to leveraging loss: I refuse to let the losses of my life count for nothing. Instead, I’m determined to use them to learn wisdom, compassion, empathy, and generosity. Loss doesn’t have to be loss. Loss can be gain. I still fight fear, you know. I probably always will. But my goal is no longer to eliminate it, but to live secured in the middle of it. When it comes to life’s storms, you and I can do very little to stop them. In fact, we couldn’t stop one if we tried. But we can build bigger boats. Which of these strategies for building a bigger boat most resonates with you? Yes, yes, yes. I so agree. The universality of suffering is heartbreaking on one hand and significantly comforting on the other. It joins us in a powerful way. I love that…”Loss doesn’t have to be loss. Loss can be gain.” I admit that sometimes I tick what I think of as “the good years” off on one hand and think about the larger spans of time I have experienced loss, but when I think of it in the terms you suggest, I realize all I have gained. I woke up last night from a nightmare. In the dream, the only place I felt safe was inside of a church. Even there, I was agitated, trying to trust but it was hard. When I woke up, I sensed that still, small voice, within me saying, “You can depend upon Me, Linda. I’m going to meditate on your words today. Thank you, Michele! Great post. I needed to read that. Well said, my friend… For years I battled this demon of fear, seeking refuge from its paralyzing grip on a daily (and sometimes hourly) basis. What was so pernicious about this monster was how it could change its face like a chameleon – stopping me dead in my tracks at every turn. Years of angst eventually gave way to peace… For me, the understanding that God was bigger than the fear was always there – I sought refuge from it in Him each time it would rear its ugly head. True freedom came for me when I began to be open with others about my struggle – that was the lesson He wanted me to learn (or at least one of them.) I eventually came to understand that fear grows strong and powerful in isolation – but it’s a paper tiger in the light of community and personal transparency where it dissipates like a morning fog, giving way to light and the hope of a new day. And thus you just lived out what you talked about. Love it. Thank you, Matt. This cuts to the heart of the issue. Thank you Michele! I have heard it said that FEAR is “False Evidence Appearing Real”. I find that most of my fear is rooted in the “what if” as if it were a given. I think the enemy delights in the “what ifs” and burrows in deep….and, sadly, sometimes I am a willing “host”. 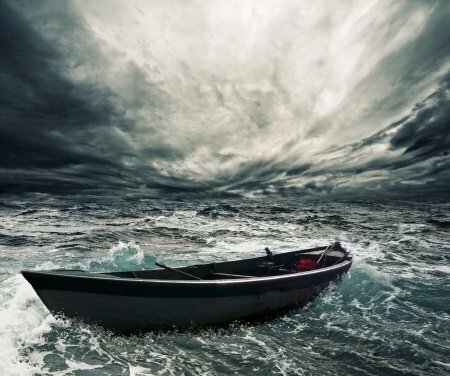 Instead of building a bigger boat as you say, I find I am gripping the sides of my boat and focusing in on the waves, my mind filled with the “what ifs”, sending out SOS’s with every breath. I love that your blueprint for building a bigger boat does not have one whiff of a “what if” but more of a “if then” approach. Storms WILL come and storms go…BUT, if then….all He is asking for is a paradigm shift to GOD and HIS perspective. The purpose of the storm is sometimes revealed…sometimes not. At the end of the day, He is asking for trust in His boat, not mine. Love it! Blessings and thank you! Once again, thank you so very much, Michele, for such beautiful insight and inspiration and encouragement. I am so thankful I found you and your blog!! I love this post. (I am participating also in the Undone Conversation. )… I have often told my friends and kids (all grown with kids of their own now), that I battle fear daily. I so agree with you that fear is not the problem, it’s part of life and it serves a purpose. A couple of months ago when I was having a particularly hard day, the Lord brought the story of Peter walking on the water to me, and He said “Brenda, keep your eyes on ME, because when you get them off of me, you sink.” Plain and simple, a message from my Lord. I’ve been trying to do that ever since, when I feel panicky or afraid, I stop and mentally picture myself looking straight on at Jesus, and I am immediately calmed. 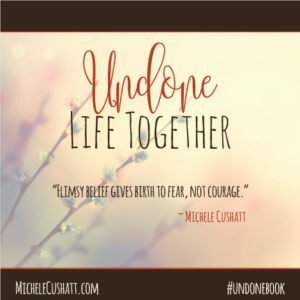 I am so thankful I found this blog and conversation, Michele, I’m sure you hear it all the time, but I am so excited to see what God is going to do through all of this! Isn’t it awesome that God can and does use “little old me/us” to further His kingdom! Man, how awesome is that? I think of you as a “kindred spirit!” 🙂 Blessings on your day! This. It’s synonymous with a thought I had last week…imploring Jesus to raise His hand and say “peace! Be still!” And these circumstances cease. But rather He shows us how He holds US STILL in the eye of this storm and that place is also a place of peace. Hmmm. So very profound Michele. It reminds me of the words in Philipians “I count all as loss that I may gain Christ” I realise that when there is no fear, we rely on our own wisdom or the strength that we think we possess. Fear is a way of pushing me not to rely on me but on the one who is bigger than the thing we fear. I embrace it because it makes me cling close to God and remind myself of His promises for me. Thank you Michele. 16 That he would grant you, according to the riches of his glory, to be strengthened with might by his Spirit in the inner man;17 That Christ may dwell in your hearts by faith; that ye, being rooted and grounded in love,18 May be able to comprehend with all saints what is the breadth, and length, and depth, and height;19 And to know the love of Christ, which passeth knowledge, that ye might be filled with all the fulness of God.20 Now unto him that is able to do exceeding abundantly above all that we ask or think, according to the power that worketh in us,21 Unto him be glory in the church by Christ Jesus throughout all ages, world without end. Amen.” What I might have once thought of as my undone, I have learned was God’s doing miraculous and wondrous things for me. What amazing grace, mercy, patience and love He has shown to this undeserving heart. “Commit to Leveraging Loss” is the biggest strategy that I resonated with. I want the Lord to take the broken pieces (pottery) of my life and make something (mozaic) beautiful out of it, that would cause others to want to take a deeper look and say, “Wow, if God can do that for her then I will believe He can do it for me too”. Yes, yes, yes. Exactly. Beautiful! Funny I read your post today, Michelle. For whatever reason, a line from the Gaither’s song went through my mind today: “Because He lives, all fear is gone . . . .” Then I thought, “No that’s not true. I love the Lord and believe the truth that He’s alive but I still fear at times.” It’s what you do with the truth that He lives and loves you that makes all the difference in what you do with your fear. I’m glad I read your post! I love your book Undone. Thank you, Kevin! I’m so glad you enjoyed it.